BEIRUT (Reuters) - World powers have passed a landmark Security Council resolution demanding an end to restrictions on humanitarian operations in Syria, but aid workers doubt it has the punch to make Damascus grant access and let stuck convoys deliver vital supplies. President Bashar al-Assad's administration and to a lesser extent rebels fighting to overthrow him have been accused of preventing food and medical care from reaching a quarter of a million people in besieged areas. Russia, Assad's ally on the Security Council, and China have vetoed three resolutions that would have condemned him or threatened sanctions since Syrian forces cracked down on a pro-democracy uprising in 2011 that has since turned into a civil war. More than 140,000 have been killed in the fighting, which has forced half the population to flee from their homes. Saturday's resolution threatened unspecified "further steps" if Damascus does not comply. Though several Western envoys have expressed strong intent to push for Security Council action if the resolution is ignored, U.N. diplomats say Russia and China are unlikely to agree to any action if Syria's government does not comply. An aid worker in the region said: "There are views that this resolution finally has some teeth. I don't see it that way." "We are watching and waiting," he added. He did not want to be identified while negotiations between humanitarian organizations and authorities in Damascus are ongoing. Jens Laerke, spokesman for the U.N. Office for the Coordination of Humanitarian Affairs (OCHA) said there was no immediate breakthrough in delivering assistance since the Security Council adopted the resolution. "Our requests are out, but there is no movement on the ground," Laerke told Reuters, referring to proposals to send aid convoys to parts of Syria. The resolution called for the immediate lifting of sieges in specific towns and cities around the country, including Yarmouk, a Palestinian neighborhood in Damascus that took in refugees after the creation of Israel, where people have been trapped for eight months by an army siege. The government says "terrorists" hold people hostage in besieged areas. 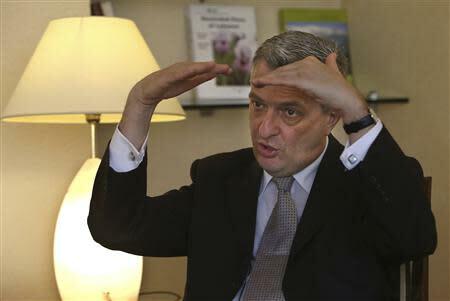 Filippo Grandi, head of the U.N. Relief and Works Agency (UNRWA), which cares for Palestinian refugees, visited Yarmouk on Sunday, where partial humanitarian access was granted this year but up to 20,000 are besieged. Grandi told journalists in Beirut on Tuesday that the resolution is "stronger than any other tool we've ever had before in Syria" and that the government had given him verbal promises that aid access to the camp would continue. "I want to take them at their word, and I trust that they will keep their word," he said. "I think there have been many situations in the country in which both sides have impeded aid from being delivered, deprived people of aid because a military and security logic prevailed. That has to end. But you know, we're not naive; we know how difficult this will continue to be," he said. Grandi, who entered Yarmouk in a U.N.-marked turquoise bullet-proof vest, said aid deliveries in Syria had to go through very complex negotiations with a lot of different groups, making each delivery difficult. He said it was shocking to see the destruction of the area and the residents of Yarmouk: "They can hardly speak. I tried to speak to many of them, and they all tell the same stories of complete deprivation." Video posted on YouTube by a citizen journalist shows residents in Yarmouk lining up to receive aid but complaining that the recent aid is much too little and they are still forbidden from leaving the area. "We don't want aid parcels; open the road, and then we can get food and drink outside," said a woman. Another man accused the government of using the small aid deliveries as a media stunt to show that the government was helping civilians. "They bring 10 aid parcels and Syrian TV films and so they say we distributed aid. This is a lie," he said, standing in a group of men, women and children, ruined streets behind them. Grandi said aid needed to go far beyond the limited area of no-man's land that UNRWA has access to and that UNRWA has only been able to supply one month's supply of food for Yarmouk's residents. "I'm pretty sure that there are many people who have never received assistance in the last month because they are too weak, or maybe elderly, or unaccompanied children," he said. On Tuesday, there was no sign that the authorities had lifted sieges on Yarmouk or other besieged areas, mostly around Damascus but also in central Homs city. The towns of Nubl and Zahra in the north, surrounded by rebels, are also mentioned in the resolution and remain under siege. There has been some modest progress since the resolution passed. This week, the U.N. World Food Programme said it had delivered enough food for 33,000 people for one month in areas around Damascus that had not been reached for more than eight months. It was not clear if this was a direct result of the resolution. Syria's public response has been mixed, but a flurry of stories on state media this week on successful aid operations shows the government at least wants to show its commitment. The foreign ministry said on Sunday it was ready to cooperate but on the basis of "respecting national sovereignty" and added that the "Syrian government has always worked on performing its duties of providing the basic requirements to its citizens". One particularly contentious issue cited by United Nations aid workers in private is a refusal by Damascus to allow cross-border operations from Turkey, which is opposed to Assad, to bring aid directly into rebel-held areas around Aleppo. At the moment, convoys from Damascus U.N. operations have to cross active front lines to reach northern rebel-held areas. The resolution demands "rapid, safe and unhindered humanitarian access for United Nations humanitarian agencies ... including across conflict lines and across borders". The regional aid worker said moving aid in from Turkey would be a massive step. "The critical question is cross-border deliveries." U.N. Secretary-General Ban Ki-moon and top U.N. agency chiefs are due to brief the U.N. General Assembly on the humanitarian situation in Syria later on Tuesday, and Ban will report to the Security Council in a month on the implementation of the resolution. Opposition activists have already accused the army of breaching another point in the resolution that demands an end to indiscriminate shelling and aerial attacks. They said air raids on rebel-held towns across Syria killed 26 people on Monday, and the Syrian Observatory for Human Rights, a UK-based pro-opposition monitoring group, said four children had been killed on Monday in Aleppo by barrel bombs, improvised munitions that can flatten entire buildings.